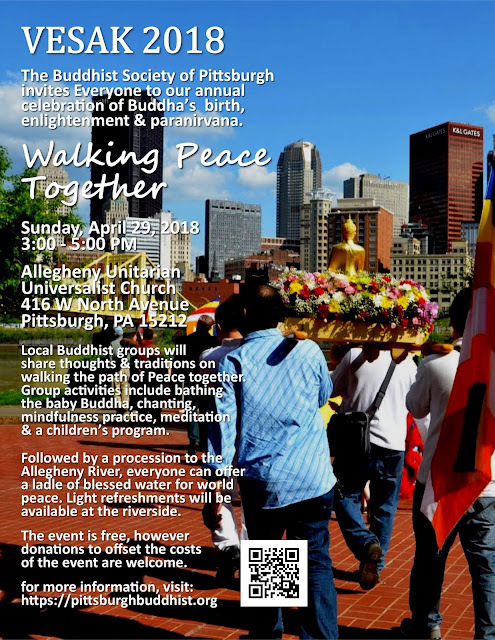 PennsylvAsia: Buddhist Society of Pittsburgh's Vesak 2018, April 28. Buddhist Society of Pittsburgh's Vesak 2018, April 28. The Buddhist Society of Pittsburgh will present Vesak 2018 on April 28. Hundreds of Buddhists from many traditions, and the public as well, will join in Pittsburgh's 10th Annual Vesak, a worldwide celebration which honors the life of Shakyamuni Buddha, the Enlightened One. Over the past 9 years, our gathering has grown to be a joyous occasion, filled with colorful flowers and the beautiful teachings and practices shared by many traditions in a collective Sangha ceremony. This year's theme - Walking Peace Together - expresses the commitment shared by our various traditions to be peace, together, grounded in our Buddha Nature, especially in this time of great division in our country. Peace is the Path we walk in mindfulness. Participants can help bathe the Baby Buddha, offering their prayers for peace within the water, which will later be processed to the Allegheny River. A shared service, held within the Allegheny Unitarian Church, will feature prayers, chants, Dharma teachings and practices from each of the local Buddhist traditions. The program includes a wonderful interactive song and mindfulness practice for children. A festive procession to the river will follow, as we Walk Peace Together. Light refreshments will also be available for attendees. The entire program is free and open to the public. The event runs from 3:00 to 5:00 pm, beginning at the Allegheny Unitarian Universalist Church on the Northside (map).